For the tool resembling a long-handled billhook and also referred to as a sling blade, see Kaiser blade. For other uses, see Bushwhackers (disambiguation). Three bushwackers; including Dave Pool at center. Bushwhacking was a form of guerrilla warfare common during the American Revolutionary War, American Civil War and other conflicts in which there were large areas of contested land and few governmental resources to control these tracts. This was particularly prevalent in rural areas during the Civil War where there were sharp divisions between those favoring the Union and Confederacy in the conflict. The perpetrators of the attacks were called bushwhackers. The term "bushwhacking" is still in use today to describe ambushes done with the aim of attrition. Bushwhackers were generally part of the irregular military forces on both sides. While bushwhackers conducted well-organized raids against the military, the most dire of the attacks involved ambushes of individuals or families in rural areas. In areas affected by bushwhacking, the actions were particularly inflammatory since they frequently amounted to fighting between neighbors, often to settle personal accounts. Since the attacks were non-uniformed, the government response was complicated by trying to decide whether they were legitimate military attacks or criminal, terrorist actions. The term "bushwhacker" came into wide use during the American Civil War (1861-1865). It became particularly associated with the pro-Confederate secessionist guerrillas of Missouri, where such warfare was most intense. Guerrilla warfare also wracked Kentucky, Tennessee, northern Georgia, Arkansas, and northern Virginia, among other locations. Two bands operated in California in 1864. Pro-Union guerrilla fighters in Kansas were called "Jayhawkers". They were involved in cross-border raids into Missouri. In some areas, particularly the Appalachian regions of Tennessee and North Carolina, the term bushwhackers was used for Confederate partisans who attacked Union forces. Residents of southern Alabama used the name in the same manner. In most areas, irregular warfare operated as an adjunct to conventional military operations. The title adopted by the Confederate government in formally authorizing such insurgents was "partisan ranger". One of them was Col. John Singleton Mosby, who carried out raids on Union forces in the Shenandoah Valley and northern Virginia. He also raided to the north in Kentucky and Tennessee. Partisan rangers were also authorized in Arkansas. In Missouri, however, secessionist bushwhackers operated outside of the Confederate chain of command. On occasion, a prominent bushwhacker chieftain might receive formal Confederate rank, as in the case of William Clarke Quantrill. Or they might receive written orders from a Confederate general, as "Bloody Bill" Anderson did in October 1864 during a large-scale Confederate incursion into Missouri, or as when Joseph C. Porter was authorized by Gen. Sterling Price to recruit in northeast Missouri. Missouri guerrillas frequently assisted Confederate recruiters in Union-held territory. For the most part, however, Missouri's bushwhacker squads were self-organized groups of young men, predominantly from the slave-holding counties along the Missouri and Mississippi rivers. They independently organized and fought against Federal forces and their Unionist neighbors, both in Kansas and Missouri. Their actions were in retaliation for what they considered a Federal invasion of their home state. The guerrilla conflict in Missouri was, in many respects, a civil war within the Civil War. Jesse James began to fight as an insurgent in 1864. During months of often intense combat, he battled only fellow Missourians, ranging from Missouri regiments of U.S. Volunteer troops, to state militia, to unarmed Unionist civilians. The single confirmed instance of his exchanging fire with Federal troops from another state occurred a month after the 1865 surrender of Confederate General Robert E. Lee, during a near-fatal encounter with Wisconsin cavalrymen. In the course of the war, James' mother and sister were arrested, his stepfather tortured, and his family banished temporarily from Missouri by state militiamen— all Unionist Missourians. The conflict with Confederate bushwhackers rapidly escalated into a succession of atrocities committed by both sides. Union troops often executed or tortured suspects without trial and burned the homes of suspected guerrillas and those suspected of aiding or harboring them. Where credentials were suspect, the accused bushwhacker was often executed, as in the case of Lt. Col. Frisby McCullough after the Battle of Kirksville. Bushwhackers frequently went house to house, executing Unionist farmers. One of the most vicious actions during the Civil War by the bushwhackers was the Lawrence Massacre. William Quantrill led a raid in August 1863 on Lawrence, Kansas, burning the town and murdering some 150 men and boys in Lawrence. The raiders justified the raid in retaliation for the Sacking of Osceola, Missouri two years earlier (in which the town was set aflame and at least nine men killed) and for the deaths of five female relatives of bushwhackers killed in the collapse of a Kansas City, Missouri jail. Following the Lawrence raid, the Union district commander, Thomas Ewing, Jr., ordered the total depopulation (both Unionists and Southern sympathizers and everyone else) of three and a half Missouri counties along the Kansas border from Kansas City, Missouri south, under his General Order No. 11. Rural farm families had to go to areas near Union camps or leave the state. Abandoned properties were often damaged by both sides. (The Missouri-Kansas border conflict was in many ways a continuation of Bleeding Kansas violence.) In other areas, individual families (including that of Jesse and Frank James and the maternal grandparents and mother of future President Harry Truman) were banished from Missouri. Besides the attack on Lawrence, the most notorious atrocity by Confederate bushwhackers was the murder of 22 unarmed Union soldiers pulled from a train in the Centralia Massacre in retaliation for the earlier execution of a number of Anderson's own men. In an ambush of pursuing Union forces shortly thereafter, the bushwhackers killed well over 100 Federal troops. In October 1864, "Bloody Bill" Anderson was tricked into an ambush and killed by state militiamen under the command of Col. Samuel P. Cox. Anderson's body was displayed following his death. After the end of the war, the survivors of Anderson's band (including the James brothers) remained together under the leadership of Archie Clement, one of Anderson's lieutenants. In February 1866, they began a series of armed robberies. 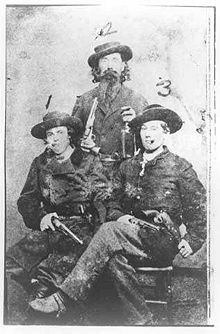 This group became known as the James-Younger Gang, after the death or capture of the older outlaws (including Clement) and the addition of former bushwhacker Cole Younger and his brothers. In December 1869, Jesse James became the most famous of this group when he emerged as the prime suspect in the robbery of the Daviess County Savings Association in Gallatin, Missouri, and the murder of cashier John W. Sheets. During Jesse James's flight from the scene, he declared that he had killed Samuel P. Cox and had taken revenge for Bloody Bill Anderson's death. (Cox lived in Gallatin, and the killer apparently mistook Sheets for the former militia officer.) Throughout James' criminal career, he often wrote to the newspapers portraying himself as a bushwhacker, and rallying the support of former Confederates and other Missourians who were harmed by Federal authorities during the Civil War and Reconstruction. After the end of the war in 1865, the Mason Henry Gang continued as outlaws in Southern California with a price on their heads for the November 1864 "Copperhead Murders" in the San Joaquin Valley of three men they believed to be Republicans. Tom McCauley, known as 'James' or 'Jim Henry,' was killed in a shootout with a posse from San Bernardino on September 14 of that year, in San Jacinto Canyon, in what was then San Diego County. John Mason was killed by a fellow gang member for the reward in April 1866 near Fort Tejon in Kern County. 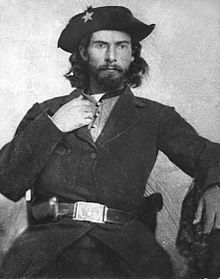 In 1867, near Nevada, Missouri, a band of bushwhackers shot and killed Sheriff Joseph Bailey, a former Union brigadier general, who was attempting to arrest them. Among those suspected of his killing was William McWaters, who once rode with Anderson and Quantrill. The bushwhackers are a major focus of Wildwood Boys (William Morrow, New York; 2000), a biographical novel of "Bloody Bill" Anderson by James Carlos Blake. The films The Outlaw Josey Wales and Ride with the Devil are both about bushwhackers. Bushwhackers appear in the side-stories of the HBO series Deadwood, set in South Dakota. The game Red Dead Redemption 2 features a gang known as the Lamoyne Raiders, who operate as post-war pro-Confederate bushwhackers seemingly influenced by the Quantrill Raiders. ^ See, for instance, The Battle of Newton. ^ Fellman, Michael (1990). Inside War: The Guerrilla Conflict in Missouri onto the American Civil War. Oxford University Press. pp. 61–143. ISBN 0-19-506471-2. Wikimedia Commons has media related to Bushwhacker.